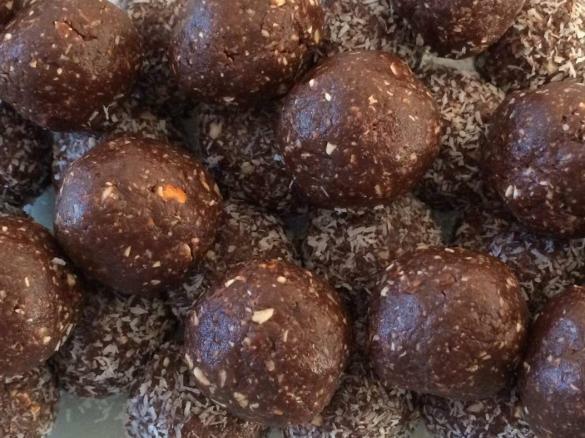 Peanut butter chocolate bliss balls by JMLO. A Thermomix <sup>®</sup> recipe in the category Desserts & sweets on www.recipecommunity.com.au, the Thermomix <sup>®</sup> Community. Place rolled oats and almonds in bowl and chop for 10 seconds, speed 4. Add remaining ingredients to bowl and mix 40 seconds, speed 9. Mix in increments to 10 seconds, speed 9 until desired consistency is reached. Note that at this stage the mixture will look quite dry and crumbly but will come together when rolled. If too dry, there may not be enough oil content in your peanut butter and more may need to be added or more coconut oil, whichever is your preference. Form into balls, rolling with your hands to bring the mix together. Balls can be rolled in additional coconut or cocoa if desired. Recipe may may be doubled for a TM5 but you may need to give the bowl a stir and then mix again in increments of 10 seconds. Flavour of these was great. Submitted by Jobee on 20. July 2016 - 16:04. This was great - thank you! Submitted by melissaladd on 6. January 2016 - 10:20.